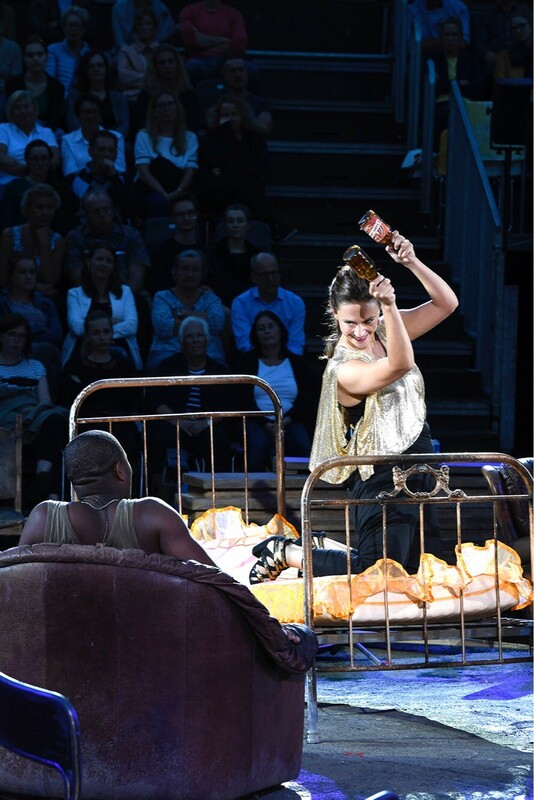 In summer 2018 Nana Dzidziguri enjoyed a huge success as CARMEN at the Braunschweig Festival. In the season 17/18 she already succeeded at the Braunschweig State Theatre as EBOLI in Verdi’s “Don Carlo”, as GERTRUD in Humperdinck’s § “Hänsel und Gretel”, the FIRST MAID in Strauss’ “Elektra” or MASCHA in Shostakovich “Moscow, Cheryomushki”. Before, the young mezzo-soprano was a ensemble member of the Tiflis State Opera for 3 years. Here she sang major roles such as CARMEN, AMNERIS in “Aida”, as well as roles in the Georgian national operas “Abesalom and Eteri” (as NAANA) and “Daisi” (as NANO) by the composer Sakaria Paliaschwili. Nana ( a niece of Paata Burchuladze) grew up in Georgia and studied opera singing at the State Conservatory V. Sarajishvili in Tbilisi. During her studies, she made her debut at the Batumi State Opera as CARMEN and FENENA in “Nabucco”. While still studying she already worked at the opera studio of the Tbilisi Music Academy, where she performed important roles of her repertoire such as MADDALENA in “Rigoletto”, OLGA in “Eugene Onegin”, MARZELLINE in “Le nozze di Figaro”, THIRD LADY in the “Magic Flute” and LYUBASHA in Rimsky-Korsakov's “Zsar's bride”. Nana Dzidziguri attended master classes with Montserrat Caballé in Zaragoza, Mirella Freni and Enzo Dara in Modena, and in Tiflis with Badri Maisuradze and Paata Burchuladze. In 2016 she won the first prize at the ‘Voci Verdiani’ International Singing Competition in Busseto and she is winner of the Premio Roma. She was also a finalist in the Montserrat Caballé Singing Competition and the International Singing Competition of the Accademia del Maggio Musicale Fiorentino at the Opera di Firenze. In the season 2018/19 Nana Dzidziguri performs Bizet’s CARMEN at the Opera House Wuppertal and also sings here FEDERICA in Verdi’s “Luisa Miller”. She makes her debut as ULRICA in “Un ballo in maschera” at the Theatre Neustrelitz and she sings Dvorak’s STABAT MATER with the Neubrandenburg Philharmonic Orchestra. She debutes as CHARLOTTE in “Werther” at the Tiflis National Opera and as SIEGRUNE in the new RING of the Bayreuth Festival 2020. …Nana Dzidziguri with her voluminous mezzo voice and her snake-like movements gave an impressive portrayal of Ulrica and her fate. Nana Dzidziguri an enchanting Federica, not only because of her uncredibly velvet chest voice register. Brillant Nana Dzidziguri with her dark voice and charisma. ….and Nana Dzidziguri sings enchantingly beautifully the duchess Frederica (who competes with Luisa for the love of Rodolfo). As soon as possible we would like to see the Georgian Mezzo soprano Nana Dzidziguri ( Frederica), who is really fascinating in every way, again. Her female counterpart Frederica , is sung just as exceptionally by Nana Dzidziguri with a wonderful soprano voice, reaching from her sounding chest into slender high registers. Because at the time the opera was wrote, it was not allowed to have a second female principal role, Verdi had to turn the role of Frederica in a part with reduced stage presence. Which was really too bad on this evening. How I would have loved to hear much more of the Georgian Nana Dzidziguri’s luxurious mezzo soprano voice! Shortly, the Wuppertal audience can look forward to this singer’s passionate, noble Carmen interpretation. Nana Dzidziguri’s powerful mezzo voice makes it quite clear that she is a mature, experienced, self-confident Frederica. Nana Dzidziguri succeeds as the duchess Federica with her dark timbred mezzo soprano voice and her glamorous acting. She has convincingly assimilated into the wicked world and is a counterpole to Luisa. Nana Dzidziguri with her rich, powerful, remarkably appealing mezzo voice… she has an enormous stage presence. …the Georgian mezzo soprano Nana Dzidziguri, who already sang Carmen in Tiflis and succeeded in Braunschweig as Eboli in Verdi’s „Don Carlo“, portrayed a Carmen with warm, female traits. When her gaze rests on José to flirt with him, one can sense playfulness, curiosity but also affection. She is not so much a calculating vamp but more a searching soul. And that is what her velvet, pleasantly warm voice expresses. 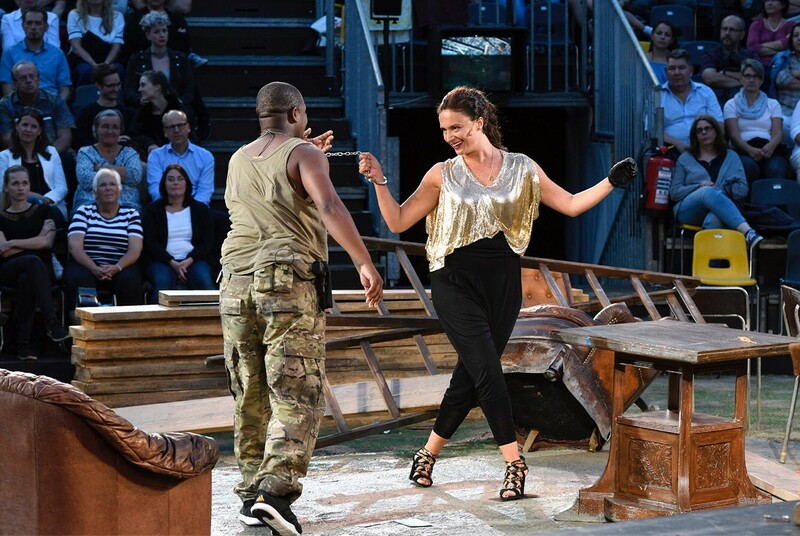 In the final countdown, when José refuses to take her, one can perfectly feel Carmen’s sublime self-assertion in the passionate depth of her mezzo voice. An enthralling portrayal. Nana Dzidziguri enthralled with strong mezzo tone full of deep power and brilliantly rising middle register, a ‘world voice’. Nana Dzidziguri is a beguiling Eboli, sings the Moorish song with secure coloraturas and grants her final appearance a dramatic intensity. …also Nana Dzidziguri very beguiling! The beautiful depths of her mezzo voice make Nana Dzidziguri’s interpretation of the Mother emotionally touching. Nana Dzidziguri as the Mother could be her sister. Her mezzo voice impresses with its serenity and its youthful vigour. .